I have a daughter. A little girl. Oh my goodness. I still can't believe it's real sometimes. I am glad that I have been fairly consistent about writing up AJ's development. The photo situation is another matter. Digital photography is a blessing, I know, I know......but consolidating and organizing all those photos: it's like a whole other job. Which is not being done. The blog entries are still the closest thing AJ has to a baby book, and probably will be until I somehow find the hours of time and motivation to make scrapbooks or photobook. I have no idea when that will be. This time last year? I was excited that AJ was babbling, and banging objects together with her hands, and sleeping in her crib. Such an amazing time....and it puts where she is now into perspective. This week she also learned the word "song" (saying "song" when a track ended) and then, she said "drum" when I played some Moya Brennan for her. Picking out the instruments. I'm thrilled. Occasionally I also think she's trying to dance, but she hasn't quite figured that out yet. Oh, I can't wait for her to start dancing. I know on that day I will feel that my life is fulfilled. AJ also knows my iPhone can play music, but it's a bit too confusing for her to operate still (and I don't really encourage her to play with it, though I sometimes let her). She loves to look at pictures and video of herself on it, however. She will ask to see "us, us": which might mean us or might be how she says her name. The other thing that stands out about AJ is how verbal she is. I long ago lost track of her word count, but she knows a dozen at least in each of these categories: animals, foods, toys, books, the house, the outside, body parts, people and relationships. She strings words together ("All gone", "Walk outside", "Mommy bike" "Kitty's toes") and she is very close to using sentences (but will most often string them together with babbling rather than strictly English). 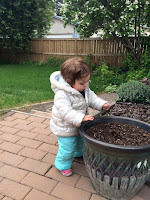 Lately she is working very hard at learning the names of all the important people in her life: Mommy, Daddy, grandparents (Baba, Grandpa, Grandma, Grandpa K, Nana, and Gidi), uncles, daycare teachers and baby friends. She identifies people by name in pictures and in person. When I pick her up and drop her off at daycare she points out the other toddlers in her room and identifies them by name (and they know her name too, which is just too sweet). My dad did not live long enough to hear AJ call him Grandpa. However, my mom has a little shrine set up at her house with pictures and mementos and the urn, and every time she visits AJ will ask to go see Grandpa. When we show her his picture she breaks into a huge smile. And she gets lots of kisses and hugs from Grandpa, via Baba and Mommy. This month we broke the walking barrier! It was awesome to see AJ get excited about walking, finally. For a long time she just didn't seem to care about it. At the beginning of May she was cruising and asking to hold our hands, but also beginning to take several steps without holding on, often at a run. It was very funny to see her realize that if she stands without holding on, her hands are free. She stood for several seconds wiggling her hands and looking at them thoughtfully. Oh the possibilities! She followed this up by trotting around and around furniture, using it to balance occasionally. Finally, in the last week of May she found the confidence and energy to walk all over the house on her own, without holding anything, although she does like to carry a toy or other small item with her. AJ has a mouthful of teeth, all her top and bottom on the front, and several molars coming up behind them. 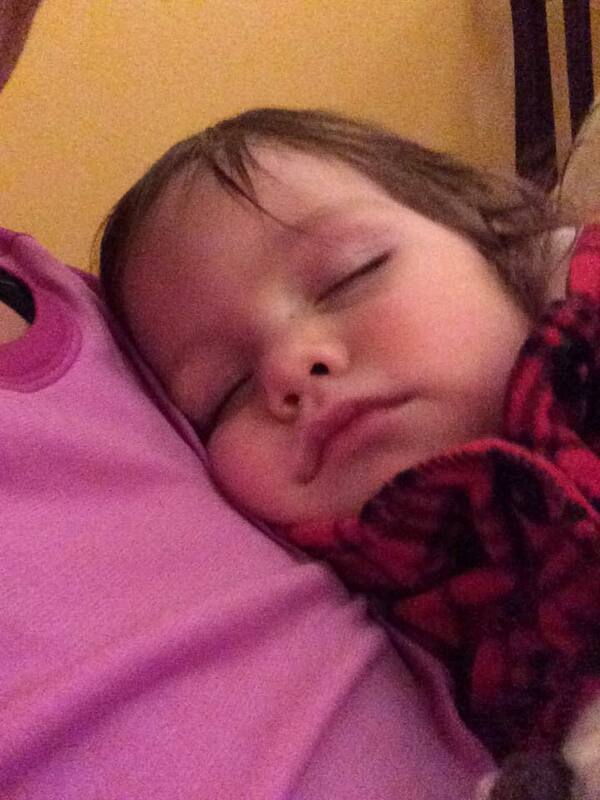 Teething has never seemed to bother her much; at least not in a way that seriously disrupts her regular life. She continues to eat well: daycare staff always tell us how impressed they are and her appetite and how willing she is to try everything. Favourite foods include bread and butter, muffins with butter (she finally clued in that butter makes everything better), cheese, grapes, oranges, cucumbers, avocado, carrots, blueberries and raspberries and watermelon when we can get them, cereal (including bran flakes), soup, potatoes, and she will even eat some chicken and fish by themselves (other times we mix it in with a potato or sweet potato.) She doesn't particularly like tomato based sauces but has started liking fresh tomatoes lately. And of course cookies, cake, donuts, chocolate, pie. She doesn't get a lot of desserts but she has them occasionally. The only problem we have struggled with is chronic constipation. We reduced dairy in her diet, offered lots of fruit and fibre, and always have water available to her. I also discovered a prune/apple juice blend that seems to help her at daycare. I think that part of the issue is behavioural: after some painful experiences, I'm sure AJ started avoiding moving her bowels, which of course makes it worse. She also tends to clench her thighs together which pushes the poop the wrong way. Finally, her poops were so huge that in some cases I think she was unable to push them out into a diaper. We have stopped using her cloth diapers, since those fit a lot tighter and have less room. We also bought her a potty, though we have not committed to toilet training. AJ calls it a "toilet" and she likes to sit on it and say "poop" and "pee" although she doesn't show any inclination to actually do those things on the toilet. We hope that she can get the idea that pooping is something you do every day and that certain behaviours make pooping easier. "Outside": looking for birds, ants, dogs and squirrels (occasionally a cat ambles by but not often). She likes to stand on the couch, look out the window, and tell us where the birds are. We had a laugh because she can't pronounce her r's or d's too clearly yet, so it sounds like she is saying "boys, boys." AJ also likes to walk outside (which she will request) and look at dirt. She is very interested in dirt, and likes to pick up any rubbish off the floor and give it to me, but the amount of dirt outside just blows her mind. She also loves rocks. Sometimes we take her to the playground and she can occupy herself for a long time picking up rocks and moving them from place to place. We joke that we don't need to go on any expensive vacations; AJ will be perfectly happy in a gravel pit. Reading books: she will methodically work through all her books (it's a great excuse for snuggles), but also has her favourites which she identifies by title. She knows many of the words in her books and can fill them in if I pause while reading. Dr. Seuss and Sandra Boynton are favourites as well as any book with detailed illustrations that she can talk about. Colouring, which means scribbling on any paper available. She says "colour, colour" and identifies yellow, orange, white, green, purple, black and blue. I am not sure why but it sounds too adorable when she makes her "bl" blend. We went on a bike ride / picnic for Mother's Day and AJ walked up to a flower and said "purple." Walking around the house; as noted above she is increasingly comfortable with this, but it is still novel enough that she is very excited and proud of herself. Lately she likes to hide behind furniture and be found. She'll look at me and say "hide." Putting on necklaces. If I'm wearing one and I take it off she wants to try it on. She has one beaded headband in particular that she likes, which she calls "Pretty." It begins. Putting on clothes. AJ tries to put on her own socks, shoes and pants. She hasn't succeeded yet, but she's come close. One morning she was trying very hard to put on her own pants and actually got one leg all the way in; unfortunately the leg wasn't in the right pant leg. I made the mistake of picking her up, and putting the pants on the right way, which led to a major fit of outrage. So much for saving time in the morning. Lesson learned. To sum it up.....we are having the time of our lives. That's the plain truth. AJ is a happy baby and we adore her and love watching her become a little girl. Maybe it gets way harder later, I don't know, but right now we are just enjoying the moment and it feels like AJ is teaching us everything we need to know (along with the occasional blog or internet article). I haven't bought any parenting books and I have no desire to. I don't mind reading about what other people do and think: I find it interesting. But we are doing fine making it up as we go along. If I could give any advice to myself before AJ's birth it would be to not worry about having little experience or knowledge of babies or small children. I think sometimes ignorance is bliss. As for me....what to say. I think I'm in good health. I try to eat well and rest well; some weeks I succeed better than others and it can depend on my level of stress. I've talked about the trying to conceive angle in other entries, and will surely revisit it again. And again and again. My body now looks and feels much as I remember it before pregnancy and childbirth. Other than a blue vein that appeared on my right breast in the early weeks of pregnancy and never went away, I feel like there's very little physical evidence that I ever had a child (other than the child herself). Maybe my hair is thicker. I am rather surprised that my body returned to its previous state, as in the months after birth I was sure it had permanently changed. My priorities during pregnancy were the health of the baby and managing my anxiety and nausea. I'm fairly active but I don't have fitness goals. I never diet. I was resigned to carrying some extra pounds but they're gone, and I am wearing all my clothes from before AJ was born. How do I feel about this? Mostly good. But with the physical evidence, and the visceral memories of pregnancy and childbirth mostly gone, it is somehow harder to believe I can or will ever have another child. Sometimes AJ feels like a miracle that landed in my life *plop* and I feel the knowledge of how she got here is lost on Atlantis somewhere. Hardly the worst problem to have, for sure. But discombobulating. Well, it's getting late. Time for Mr. Turtle and rest. Thanks always to all who read and leave a note. Mr. Turtle is an counsellor, and graduate student of psychology. So, a bit of an expert on why people do the things they do, which is a useful skill to have in a family. The other day we were talking about the lottery and why people buy lottery tickets. I don't buy lottery tickets. I would rather spend my money on something tangible or save it up for something tangible in the future. I probably made some comment along the lines of "I don't understand why people think buying lottery tickets is a good idea." Mr. Turtle's answer: It's not that people are convinced they are going to win ten million dollars or whatever it is. But in between buying the lottery ticket and finding out they didn't win anything, they can imagine what it would be like to win the lottery. What they are really buying with every lottery ticket is hope. I probably shook my head at Humanity and went on with my day. Until it occurred to me that I have much the same attitude toward trying for a baby. I have some real hope that we can get pregnant again without treatments. But my intense emotional need to "try" every cycle has much in common with playing the lottery. In between the attempts, and getting the The Period (or much less frequently, a negative test), I can imagine what it would be like to be pregnant again. And yes I do, every time. No matter how unpromising the prospects, there's usually a day or two when I can convince myself that It Really Might Have Happened. Yeah, only for about a day or two lately. The fertility situation is crappy. 17 days. 20 days. The last promising one was 26 days, and we didn't get pregnant. I'm still kind of sad about that. I tend to look back at every cycle over 25 days and wonder if that was my last good egg, and we missed our only chance for another child. I'm pretty sure this is crazy. I do it anyway. We have an appointment scheduled with The Fertility Clinic for the first week of July. One advantage of already having a file: they responded to our doctor's referral within a couple of days, rather than a couple of months. I didn't expect to hear from them so soon and was actually kind of dismayed. I was relieved to hear that the appointment is a couple of months away, though. It gives us some time to mull over our feelings on the matter. And a few more chances to play the lottery. No Kidding in NZ recently wrote a post about "Joy Olympics" or, basically, the assumption that one kind of life brings more joy and happiness than another kind of life. People might make this assumption about their own lives, or they might make it about others' lives: "My life would be so much more joyful if I had Z," or "Ms. X is obviously happier than Ms. Y because Ms. X has Z and Ms. Y doesn't." On the other hand, No Kidding's post got me thinking about whether I would say I'm more "joyful" after having a child. I think there is more grounds for comparison when I focus only on my life. I found it an provoking question to ponder. First I thought it was interesting that NK used the word "joy" rather than "happiness." They might seem similar, but I feel they have very different meanings. "Happiness" to me is a state of general contentedness with one's lot, while "joy" is an intense appreciation of a moment in time. So, more joyful with child or without? readiness for transformative experiences. This one is nebulous, but I could describe it as the constant feeling that an amazing experience or opportunity could change my life for the better. This belief required alertness to what life was bringing my way, a willingness to treat each opportunity as a treasure. Now? Well, the simple logistics of life make many of the things I formerly enjoyed harder. Anything I wish to do simply for myself does not involve only money and time, but the mobilizing of other people to care for AJ, extra planning for meals, schedules, organization of materials, etc. Band I have dropped (too much practice and rehearsal time) and knitting and crochet (lost motivation somewhere) and while we travel locally, we are unlikely to plan any long trips (i.e. overseas) until AJ is old enough to remember the experience. I still stepdance, but feel like I am learning more slowly than previously and new steps don't seem to stick very well, somehow. Friendships: I do maintain some but I don't see my friends often. Evenings and weekends seem like just enough time to spend with AJ and Mr. Turtle, or with my mom or local in-laws. If we squeeze in some of the errands and chores we need to do, even less time. Some friendships seem to easily survive these dry spells; in some other cases I've definitely grown somewhat apart from people. Readiness for transformative experiences: Because I am not seeking a transformative experience, I am generally less excitable, and you could argue, less joyful. It's not that I don't want to have fun experiences or enjoy myself, but I'm not always looking for something to rock my world. The obvious reason is that I have already found it: my family. My world rocked and rollicked about and now it's settled into its new rhythm. Family life brings me profound happiness and contentment, but a side effect of that contentment is that I am a little out of practice at getting really excited about life. I like (and need) the security I feel, but sometimes I am nostalgic for the past days when I knew that my life could take a completely different direction in the next month, or year, and that was totally OK. Despite the nostalgia, do I regret for an instant that I have a child? No. But I recognize that motherhood has changed me and the change is not quite as simple as adding an extra helping of joy. Sometimes days it feels that simple, not going to lie. AJ is joy; in fact that is her middle name. Holding her sleepy heavy body in at night and first thing in the morning. Hearing her laugh of delight as she masters a new skill or piece of knowledge. Watching her with Mr. Turtle and feeling the love between us grow exponentially. It is easy to feel that anything else in life is by comparison a mere shadow on a wall. We are also lucky in that so far we have a pretty easy child. But even if she was a huge challenge, or becomes one later, I can't see myself ever regretting parenthood. I see life as a progression, a taking on of challenges, and I'm sure I'd rather have a challenge than no progression at all. I've had stagnant periods in my life and I hated them more than anything. I would choose to live over the worst struggle in my life rather than the times when I felt I was accomplishing nothing and getting nowhere. And yet. There are questions in my mind. If I'm spending less time and energy on the things that gave my life meaning, is my life becoming less meaningful? Am I missing out on chances to change myself for the better? Am I becoming more anxious, more pessimistic because I am focusing on the things that could take away what I have, rather than what would improve it? I don't have quick answers to those questions, but I think they are important to raise. At least sometimes; the rest of the time I'm quite happy to play with my baby and appreciate what I have in this fleeting present. And last, best not to make assumptions about other people's lives, or even your own, come to think of it.